Hello and welcome to the third group post for the October Papertrey Ink Release! The new products you are seeing here will be available in the store at Papertrey Ink on October 15th at 10:00 EST! 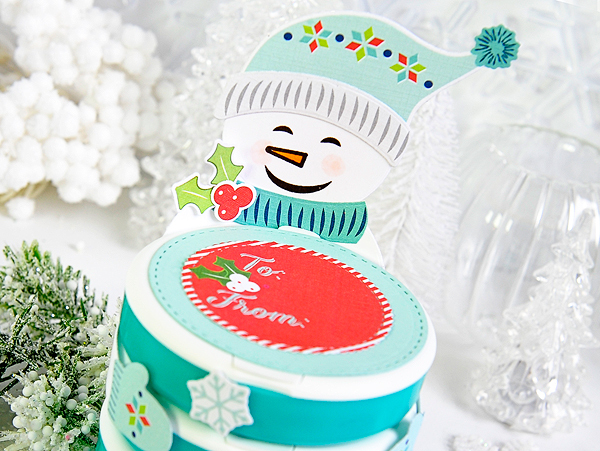 Today we are introducing Betsy's newest Make it Market Mini Kit: Holiday Hugs! What a fun kit this is too! Such a cute idea, and wonderful way to dress up a small gift! The arms of the Santa and snowman can be wrapped around so many different things, a jar, a candy bar, gift card, pillow boxes, or a small gift, just to name a few! So for my little hugger, I used a stack of Wintergreen Ice Breakers. They're my favorite! 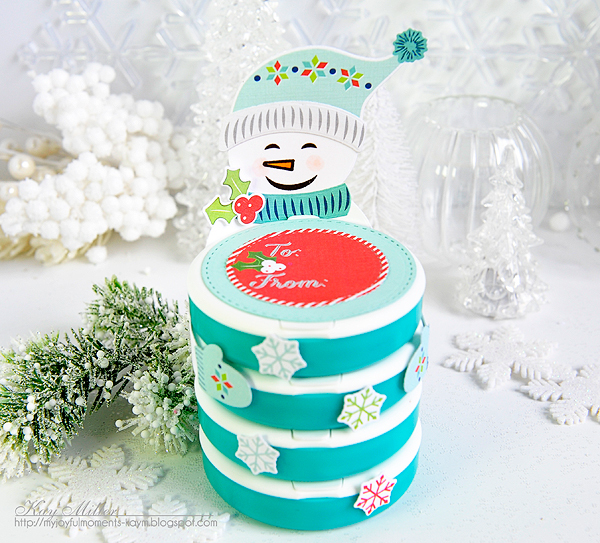 I don't like peppermint or spearmint, but I do like wintergreen, and the colors of the little containers looked so wintery and were a perfect match for the preprinted snowman cut outs! I adhered all of the containers together with foam tape first. I cut out a circle of Aqua Mist card stock and glued that to the top, then added the circle tag from the kit on top of that. I cut out the base of my snowman with the New Tag Sale: Huggable dies, then cut out all of the pieces of the snowman from the preprinted sheets that come with the Holiday Hugs, Mini kit. I stamped the snowman's face, then glued on the hat. I wanted my snowman to have a scarf, so I created one with one of the hat bands. I cut it out, trimmed a bit off of one edge and then turned it upside down and glued it to his neck. I then added the holly and berries at the side. I glued the mittens to the arms, then added some foam tape and wrapped him around my stack of Ice Breakers. I cut out a few of the snowflakes and glued them randomly around the containers. This was such a fun project! I can't wait to use the Santa on something next! Thanks so much for stopping by! I'll be back tomorrow with our last peek of the new products coming to Papertrey Ink October 15 at 10:00 EST! I always have those mints in my purse and the Grands always ask if they can have a "Mimi Mint". They would have so much fun wit the little hugs wrapped around there. Such a clever and adorable way to feature the huggers! A perfect giftie for one of my friends, who, like you, is a wintergreen fan. Thanks for the inspiration! What a delightful happy creation with the sweet snowman, Kay!!! Gorgeous color and dimension...so fun!!! Adorable! Here, here on the Wintergreen mints too! This is absolutely darling!! How perfect are the little containers!! Oh, how sweet this is, Kay! 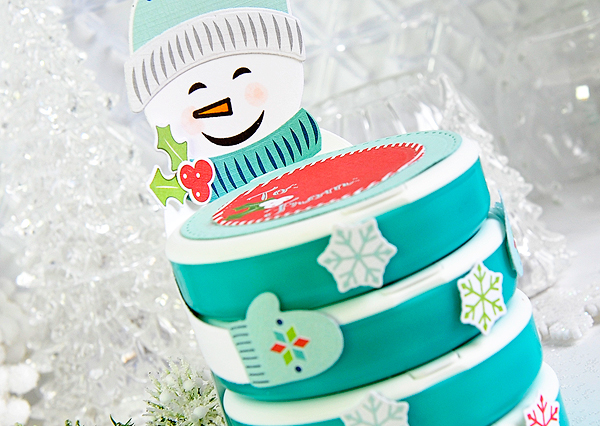 I love how you used the Ice Breakers for this Holiday Hugs snowman...so adorable! I also have to tell you that I'm so impressed with how you showcased it in your photo...so professional!! !